SPONSORED BY: Musicrow Audio Software - 10% off all products! Musicrow develops high quality audio software for the professional musician. Our products include VST instruments, pro ensembles for NI Reaktor, and soundsets for leading soft-synths. * Crow Gold Pack: An exclusive collection of cutting-edge ensembles for NI Reaktor. * Magic Vox: Unique virtual instrument with a distinctive mesmerizing sound!. * Vintage Strings: Super realistic virtual string machine. * PianoBoy: A realistic and sonically beautiful acoustic piano. * Modular Dream, The Arp Kingdom, Classic Minitunes: Soundsets for Arturia soft-synths. In this issue, you'll find the following... articles (Bass Boom, V-Vocal, AudioSnap, ACID Loops, SD2), free downloads (Blue Cat Pack, Shaker Maker, Acoustica, Inspector), news (RX, Live 7, Max/MSP, FL Studio 8, SampleTron, Garritan), discussions (iLoK, ProTools, Melodyne, SampleTron, E-MU, Comping), reviews (Adobe Audition 3, EastWest PLAY, EastWest Gypsy), music (The Children, Fragile Syndrome, Last Of Windsor). And you could win a free Vocal Trainer package from SoundTech! When you enter the shop, you'll see Today's Best Deals displayed and at the bottom of the page, you can click the More Results button to see more of today's great deals. 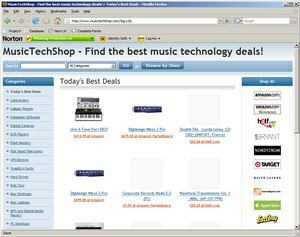 In addition, you can use the Search box at the top of the page to find deals on specific items. For example, type in Cakewalk Sonar to find the best Cakewalk Sonar related deals. Not only that, but if you're looking for something other than music gear, you can also shop for deals on all kinds of other products. To do that, you can either use the Search box or just click on one of the categories listed on the left side of the page. I hope you enjoy the new MusicTechShop! In previous issues, I gave a special thanks to all those who have posted nice reviews about my books over at Amazon and AmazonUK. The great reviews keep coming in, so additional thanks go to: A Customer and Thomas E. Sullivan. "Vocal driven, mixing electronic elements with real musicians playing real instruments, The Children creates a deep immersive sonic emotional landscape." "Borrowing influences from Rammstein, Godsmack, ::Wumpscut:: and others, Fragile Syndrome takes hard rock guitars and fuses it with an electronic/synth presence and tight drumming." "The music reflects influences by The Rolling Stones / The Doors / Lynyrd Skynyd / Van Morrison / Eddie Money / Hootie and Edgar Winter. If you enjoy the music of the groups mentioned you will enjoy the music on this CD." Groove Monkee Releases Fusion MIDI Beats Library - Get 10% off! Congratulations to Reece B and James A for winning the Toontrack EZdrummer contest! (Winners are notified by e-mail). Reece B says, "I just got my copy of EZD on Wednesday! I've loaded it and played with it some. I can't wait to dig into it more! I am so grateful and excited about winning this contest! I've been telling all my friends!" James A says, "I just got my EZ Drummer today and I love it! Wow I've never won anything ever in my life. It sure was a pleasure coming home and it was on my doorstep. It's a big step up from the session drummer 2 sounds and quality. Awesome sounds!" For the current contest, DigiFreq and SoundTech are giving away some free Vocal Trainer packages! Two lucky winners will each walk away with a SoundTech Vocal Trainer package. Details can be found on the DigiFreq Contest page.